John, for god's sake, it's only a cricket match. We're not re-enacting scenes from The Godfather. I know that you're given to hyperbole, but let's keep some perspective here. "Revenge is a dish best served cold". Honestly. Look, we sports fans are known for occasionally going OTT, but what with the credit crunch, rising prices, pension shortfalls and service cuts, allow me to engage in a wee bit of hyperbole for now. OK? Last night, Colin and I went to watch a 20/20 cricket match at Trent Bridge cricket ground. Teams in the Friends Life t20 cricket league are required to have rather silly names, a bit like in ice hockey and rugby league. 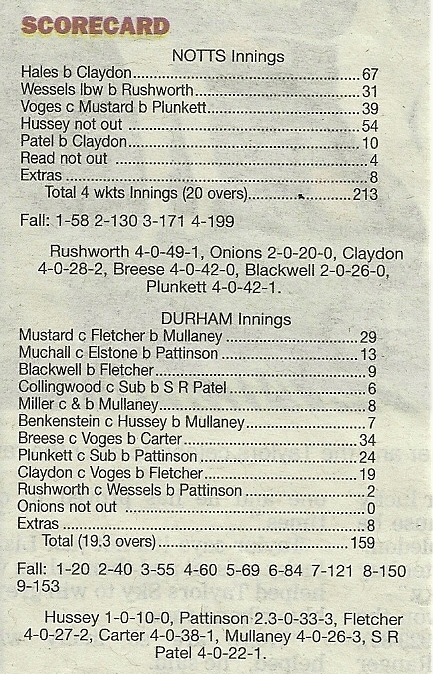 So the match was between Notts Outlaws and Durham Dynamos. Notts had won their first four matches, only to come a cropper last Tuesday up at Durham, where they lost. Last night was therefore an ideal opportunity to quickly gain 'revenge', and go back to the top of the league. Thankfully the rain held off, as dark clouds passed by just missing Trent Bridge. There was a double rainbow to be seen in the sky (where else would you see it, you ask? ), and from our high vantage point in the Radcliffe Road stand it was a spectacular sight (slight hyperbole again, as it was really just OK). For those unfamiliar with 20/20 cricket, each side has to bowl 20 overs, with the batting side having to make as many runs as possible during those overs. The side scoring the most runs wins. You're possibly feeling a little bit insulted by this explanation, aren't you? Each bowling side has about 75 minutes to complete their 20 overs, and there must be some punishment for not doing so. I can't ask Colin again about this, as I'm sure that he's explained it to me, but I've forgotten. So there we were, high up in the stand, looking down the wicket towards the electronic scoreboard and the Pavilion. Notts won the toss and elected to bat first - which apparently they like to do in this form of cricket. They raced to a big score, with what seemed liked masses of fours and sixes. In particular, Alex Hales who scored 67, and captain and Australian international, David Hussey, 54 not out, helped the team to a total of 213 for 4. This was an average of 10.65 runs per over, which if you want to take this game seriously, is an important figure to keep in mind, as now the visitors have to beat this over rate. After a brief interval, where there was just enough time to go to the loo and get a drink, we were back for the Durham innings. Actually, we missed the first over, with Durham scoring 10 from it. 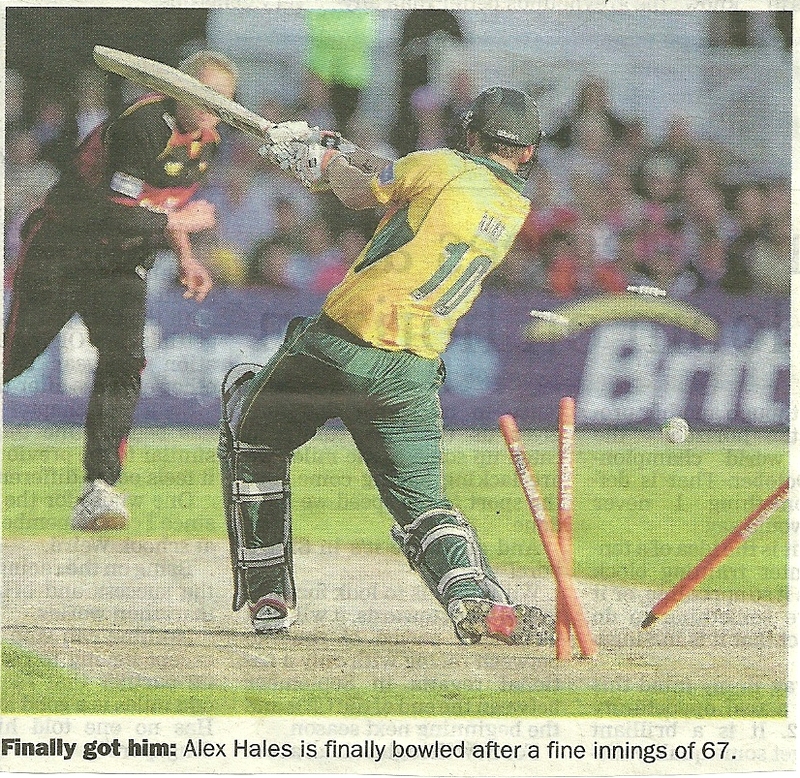 They continued to hammer the ball in the second over, and suddenly the Notts score was looking a bit vulnerable. Colin assured me that this game could change very quickly, and sure enough, wickets began to fall. 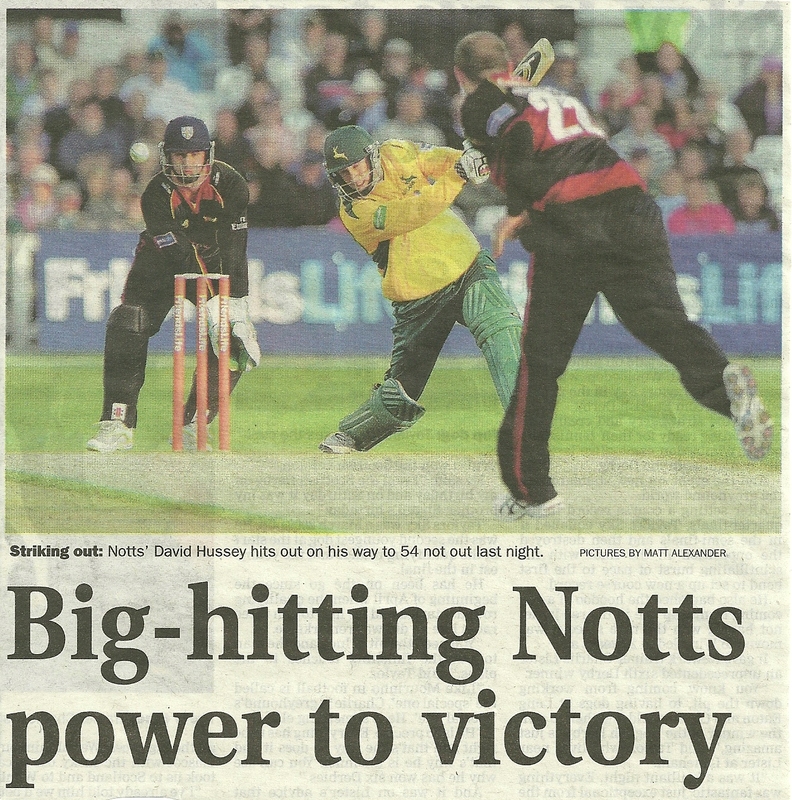 By the time the 5th wicket fell, Durham had only scored 69 runs, and were so far behind in the runs needed per over, that the game was effectively over as a contest, hence the Nottingham Post headline, "Big-hitting Notts power to victory". Durham Dynamos were all out for 159 in the final over. You can read a full report of the match in today's Nottingham Post - I feel obliged to give them some publicity, as I've nicked their photos for this blog. I thoroughly enjoyed the match. Trent Bridge is a great ground to watch cricket, and as a senior citizen, with advance booking, it costs me £7 to watch 20/20 cricket, which for three hours of entertainment, is good value I think. There are plenty of food and drink outlets in the ground, which seem to be well frequented. I was also pleased to see so many youngsters there, though I did worry a bit when a group of them sat a few rows in front of us carrying those blow-up sticks that cause a mighty thwack when banged together. However, apart from occasionally hitting each other over the heads with them, they were hardly used. I can't help observing people when there's a break in play. Just in front of us when Notts were batting was a man and, I assume, his girlfriend. I think that this may have been her first cricket match, but it certainly wasn't his. Throughout the innings he was telling her what was happening, and what everything on the scoreboard meant. He was very enthusiastic, jumping up and applauding when a good shot had been made, and jiggling to the sound of music that blasts out every time the ball reached the boundary. I think I detected a glazed look in her face by the time of the tenth over (I'm familiar with that look when I talk to people about something that I'm passionate about - currently it's my family heritage), but bless her, she was trying her best. I thought that the man might have been a bit excitable because he was trying to impress her, but to be fair to him, he was obviously passionate about cricket, and would have behaved like that even if he was on his own. He was certainly in stark contrast to me, with my gentile clapping, and whispered 'good shot'. I'm just not the demonstrative type. With the Notts innings over, we went down in the lift (we were three floors up) to get a drink. A total stranger questioned was I happy with the Notts score? He seemed reluctant to believe me when I said yes. I thought, here we go again, he's looking at my face and thinking I'm miserable. I've had this all of my life, and no amount of jesting about being born with this face appeases people. I try very hard to look happy, but no matter, I always look as if I'm Jack Dee's brother. Ah well! But this wasn't what he was on about. Apparently it was my 'Geordie accent' that gave the game away, and I must therefore be supporting Durham, who've just had seven bells knocked out of them, so there was no way I could be happy about that. He would not be moved from his position in the short ride to the ground floor. I have lost count of the number of times over the last thirty years that people have assumed that I came from the North East because of my accent. I've spent two days in Newcastle over that period, and have no family or friends from that region, and I think that my accent is nothing like Geordie, but people still keep insisting that it does. It shouldn't bother me, but it does, as I want at least a hint of an accent from somewhere that I've lived. But as they say, hey ho. As much as I love Trent Bridge and the 20/20 form of cricket, there is one element of it that I'm really struggling to get to grips with. That's the razzmatazz that goes along with it in the name of creating an entertaining spectacle. If I had a history of watching cricket, I would definitely have come from what I might call the John Arlott school. I don't need or want razzmatazz. There's pre-match entertainment, because we'll all get bored if we have to sit there for 20 minutes waiting for the match to start. There may have been hoola-hooping dancing girls last night, but my eyesight, even with my glasses on wouldn't allow me to see that far. There's a pitch side announcer who seemed to see his job as whipping the crowd into an anticipatory frenzy. "Radcliffe Road stand, give us a wave", you'll be seen on the scoreboard TV screen. No I won't, thank you very much. Thank god there was no one there in fancy dress. A couple of weeks ago there was a televised 40 over match at the Bridge, and watching the crowds arrive, I spotted Mr Blobby, and a man dressed in a woman's bathing suit and a long blond wig. They weren't going to watch cricket, they were going to get on the tele. They could then endlessly regale their family and friends with the video recording. "That's me, Mr Blobby". Or, "That's me, the prat in the bathing suit and wig". Also in 20/20 every boundary scored is greeted with a loud blast of music, as if we need to be told to get excited about that. Do you know, maybe I am Jack Dee's brother. Last night was only my second cricket match, and what really annoys me about the razzmatazz is that I don't need it, and it is a sad reflection on others if they do. I just want the cricket to interest me, I want the cricket to enthuse passion, I want the cricket to excite me. Take away the gloss, and that's what the cricket does for me. I just don't need anything else. It will not stop me going though. I'll just have to practice harder at not looking like Jack Dee, and perhaps start talking with the Welsh accent that I was born with. Phew, that was a bit of a moan wasn't it? 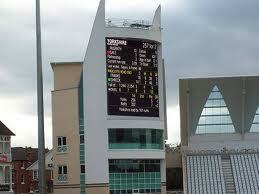 Let me finish by saying that I love the electronic scoreboard at Trent Bridge. It's at the Pavilion end of the ground, and even from the opposite Radcliffe Road end it can be perfectly seen. It provides you with every bit of information you could possibly want on the match. To a novice like me, it really is quite indispensable. Even the Duckworth Lewis system is understandable if that needs to come into the reckoning. The full screen photographs of players are helpful in identifying them, and the analysis of each bowler and batsman when they have either completed their overs, or completed their batting innings is exceptional. You get so much more than the score these days, and for a statistics buff like me, I love it. So another good evening at Trent Bridge (apart from the you know what), but next time I must remember to wear my thermals, even in June, as it gets a bit nippy near the end of the evening.